Despite a string of successes behind her name over the past 12 months, South African road champion Carla Oberholzer feels she still has plenty of room for improvement. 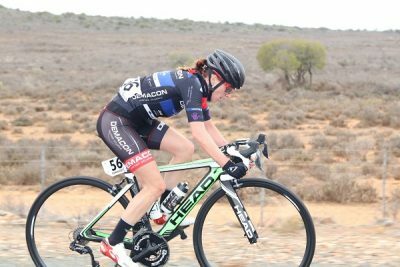 The Demacon Women’s Team rider’s latest triumph came when she won the title at the national road championships in Oudtshoorn early this month. Last year, Oberholzer was at the forefront of many of the country’s major road races, picking up four top podium spots, including the Bestmed Cycle4Cansa and the Amashova Durban Classic. However, even with the national road title under her belt, the 31-year-old said she knew there were always aspects to work on in her cycling. “I think it’s very difficult to say you are riding at the peak of your ability,” she said. “I do have good form which I carried over from last year, so things are definitely going well. Nonetheless, she is pleased to have ticked off another goal on her list after being crowned SA road champion. “Winning the SA road title was my first big goal of the year, especially after last year’s race when I thought I had a chance but just didn’t make it. Oberholzer and Dalton, members of the Demacon Women’s Team who have HEAD Bikes SA as their equipment sponsors this year, are joined by Lynette Burger and Kim le Court. The SA road champ said their strength lay in the team ethic they had created. “Individually, we have four strong riders, but our real strength lies in the fact that we work so well together,” said Oberholzer. “We encourage each other 100% and there’s never a situation where we have a lead rider for the day. Oberholzer said they had received a massive boost with the HEAD Bikes sponsorship. “Having an equipment sponsor for ladies’ cycling in South Africa is huge and for us it is a big thing. It is a major step up. “I am totally satisfied with the bike I have, which is slightly heavier – about 100g – than the bike I rode previously, but it’s much more responsive. Oberholzer, who will be riding in the Bestmed Berge en Dale on Saturday, said they were also focused on the Bestmed Tour of Good Hope and the Cape Town Cycle Tour in the immediate future. South Africa’s premier stage road race, the Tour of Good Hope takes place in and around Paarl from March 5 to 9, followed by the Cape Town race on March 11. HEAD Bikes SA, who entered the local market late last year, offer a limited range of road and mountain bikes to South African cycling enthusiasts, retailing their products online only. Go to www.HEAD-bike.co.za or follow the website link on their Facebook page.